Passed away peacefully at the Brockville General Hospital, Charles Street Site on Sunday, January 6th, 2019. 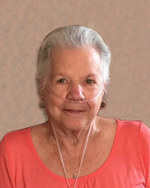 Beverly (Renaud) Ward, at the age of 77 years. Beloved wife of the late Colin Ward. Loving mother of Richard Gladwin (Sheelagh), Sandy Leroux (Steve), Karen Martin (Jerry) and Ray Ward (Katie), predeceased by her daughter Wendy Thornhill. Dear grandmother of Michelle Thornhill, Shannon Martin, Nick Thornhill, Scott Leroux, Spencer Leroux, Alex Martin, Desmond Martin and Deacon Ward. Cherished great-grandmother of 10. Dear sister of Bobby Renaud (Lisette), Larry Renaud, Gary Renaud (Marlene), Carol Nangreaves (the late Jim), Sharon Smith (the late Hal) and Steve Renaud. Fondly remembered by her very best friends; Linda and Ross Barton, and by many nieces, nephews, and extended family. A private family service will be held at a later date. In remembrance of Beverly, memorial donations to the Heart and Stroke Foundation or the OSPCA - Leeds and Grenville Animal Centre would be greatly appreciated. Arrangements are in the care of Irvine Funeral Home, 4 James St. E., Brockville. Send condolences or make a donation online at www.irvinememorial.com. This obituary is protected by copyright by Irvine Funeral Home and Chapel. Proudly Serving the Communities of Brockville, Maitland, Prescott, Athens, Spencerville, Cardinal, Mallorytown, Rockport and the counties of Leeds and Grenville. Irvine Funeral Home and Chapel is located in the province of Ontario, Canada.